See the most beautiful stretches of coastline and postcard-perfect villages along the Amalfi Coast with our fully-equipped boats, featuring spacious sun decks, private bathroom facilities, and private cabins. Cool refreshments and towels are also provided on all our Amalfi Boat tours and transfers. Whether you are looking for motor boats, luxury speed boats, yachts or sail boats, we can accommodate your request for an all day boat tour...or charters by the week or month. We offer embarkation from any point along the Amalfi Coast for boat tours or boat transfers, and can arrange private sea transfers to/from the Amalfi Coast, Capri, Naples, Ischia and beyond. We are waiting to welcome you on to one of our fabulous Amalfi Boat Tours! 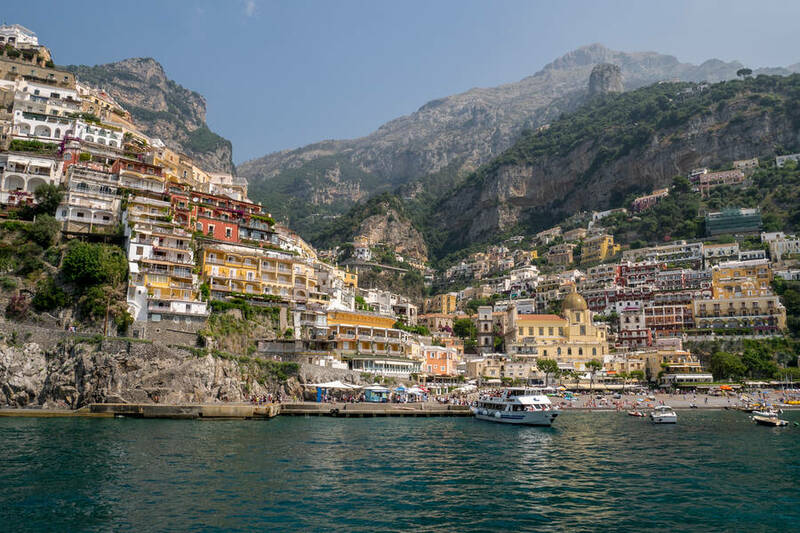 We begin the day with a fabulous boat tour along the Amalfi Coast and around the Li Galli Islands, located in the Bay of Positano, and once owned by Rudolph Nuryev. We can either stop in the cozy village of Nerano where you can feast on fresh local seafood or continue on to the glorious island of Capri, where you have time to enjoy an independent or guided island walking tour. During our boat tour, we will circumnavigate the island of Capri, passing through the Famous Faraglioni rock formations, visiting many characteristic grottoes of the island, such as the Green, White, and Blue* grottoes, to name a few. Naturally there is time to enjoy a dip in the crystal waters of the hidden coves before returning to the Amalfi Coast. We depart from Amalfi and head east to the magnificent town of Atrani, which is characterized by beautiful homes clutching the rugged hillsides - until we view the sweet waters of the Mormorata Cascade - where one is compellede to take a swim. The Secret Coast, less famous, but certainly no less beautiful and evocative, is a coast of ravines, secret beaches, and grottoes. We will follow the coastal beauty passing in front of "laughing Minori" and "majestic Maiori" and Norman watch towers all the while visiting the lesser known inlets of the coast, the Norman Coast, with its secret coves and gorges. Enjoy a dip in the Bellvaia Grotto known for its sulfurous waters. We arrive in the wildest, unspoiled area of the Amalfi Coast where we view stalactites, fantastic profiles of cliffs, the "Capodorso" - the bizarre "head of the bear" - and the old lighthouse. We proceed and view the great sandy marina, the tiny homes, the Angevin Tower, and continue on our Eastward voyage. Behind the towering cliffs there lies a pristine, quiet beach - perfect for those who appreciate solitude and the wonder of nature. Amalfi Boat Tours "Sunset Cruises" & "Star Gazers Delight"